Perisai currently owns one jack-up drilling rig, Perisai Pacific 101. We have two more rigs underway, to be delivered in 2H 2015 and 2H 2016 respectively. All our rigs are of PPL Pacific Class 400 design, incorporating the latest in features and drilling capabilities. Our rig fleet is capable of drilling wells of up to 30,000 feet in water depths of up to 400 feet under high pressure, high temperature (HPHT) conditions. They are also capable of performing offline activity while drilling, can be jacked-up with full preloading tanks and has full service accommodation for 150 personnel. Our offshore production segment is supported by our FPSO Perisai Kamelia and MOPU Rubicone. Perisai Kamelia is a gas export FPSO vessel specially designed for offshore production and export of gas and condensate. The FPSO can support gas export of 175MMscfd @ 2000psi with 275,000bbls cargo storage capacity. 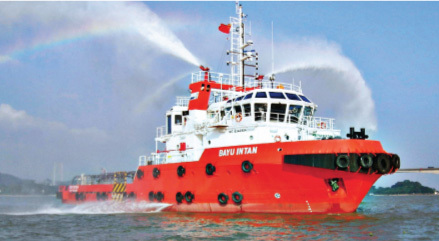 The Rubicone is a Malaysian flagged BV Class MOPU, converted in 2011 from a BMC-250 Mat Supported Jack-Up platform. Equipped with a rack and pinion elevating system powered by Hagglunds hydraulic motors, the Rubicone is 58 meters in length and 40 meters in breadth. Weighing at 5,113 tonnes, it has a daily production capacity of 165 million scf of gas and 7,306 barrels of fluid. Perisai owns a fleet of Offshore Support Vessels supporting the offshore development and production of oil and gas fields. With the recent addition of AHT Lewek Robin, our fleet now comprises three (3) Anchor Handling Tugs (AHT), three (3) Anchor Handling Tug Supply Vessels (AHTS) and three (3) Crew Boats. 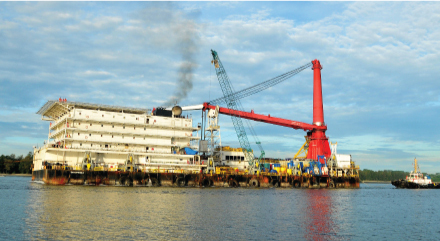 Perisai's offshore construction segment is supported by Enterprise 3, our Derrick Lay Barge. The Enterprise 3 (E3) is an ABS Class A1 vessel capable of installing offshore structures and pipelines. Built in 2008, the E3 can accommodate a crew of 300 in its air-conditioned living quarters and is fully equipped with recreational rooms, a 150-seat galley, offices and conference facilities and has a designated deck space of 1200m2. It is also equipped with safety equipment, helicopter navigation system and a helideck capable of handling a S92 Sikorsky helicopter.